This article will walk you through Easify Software Licensing in order to help you choose which sort of licensing will work best for your business. Choosing the right Easify licensing model can help you to achieve the most cost effective licensing model while making sure you get access to all the features that you need. What is an Easify Software License? An Easify software license, is really nothing more than our permission for you to use our software. Licenses are purchased from our online shop, and when you purchase a license, it allows you to carry on using Easify Software beyond the free trial period of 30 days. If licensing is pretty simple, Why do I need to read an article in order to understand it? Our licensing model is pretty simple, in fact we only offer two different types of license. However the type of license you choose can affect the way you use Easify in your business. So reading this guide will help you to understand the different types of licensing that are available to you, and how to choose the best one to suit your needs. What if I choose the wrong type of license? If you choose the wrong type of license nothing bad will happen, it might mean that the way you are licensing your Easify Software is not a cost effective as it might be. Or it might mean that certain useful features of Easify (such as remote access) are not available to you. What if I just want to simply run Easify on a single computer for my small business? No problem at all, no complex licensing required, simply purchase an Easify Pro Starter Pack and it will contain all the licenses you need! You can purchase the Easify Pro Starter Pack in our online shop. Easify Software consists of two parts. The Easify Server that holds your company data in a central location, and Easify Pro which is the client software (or user interface) that you use to talk to the server. If it sounds complicated, it isn't. The Easify server is basically your database, Easify Pro is the application you use to access the data in your database. The Easify Server contains your company data and is the central hub that holds your company data (product list, customer list, orders, invoices, supplier lists etc...). The Easify Server would typically be installed on a single computer on your network (On-premises), or you it could be hosted by Easify in the Cloud (Easify Cloud Server). Easify Pro is simply the application that you use every day when using Easify. Whereas the Easify Server would be installed on a single computer on your network or provided for you in the cloud, Easify Pro client software would be installed on every computer that you want to access Easify from. 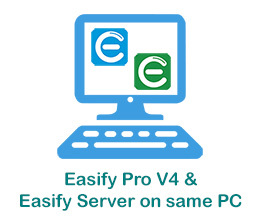 The minimum requirement in order to be able to use Easify, is one Easify Server and one Easify Pro client. Or you can install the Easify Pro Client on one computer, and the Easify Server on another. In the above example, the Easify Server computer and Easify Pro computers are both on the same local network (LAN). This is how things would typically be configured at your work place (on-premises). Your work computers would be networked on a local network so that they can "see" each other. 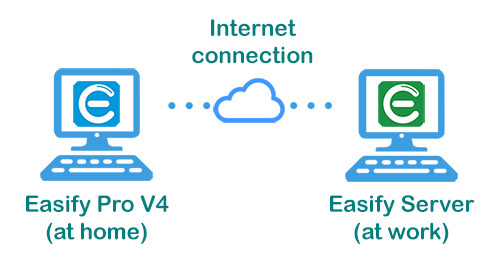 The third configuration would be that you have your Easify Server on a computer at your work premises (for example), and you use an Easify Pro client that connects to your Easify Server over the internet (from home for example). Even though you are accessing Easify via the internet, this is still an "on-premises" configuration because your Easify Server is hosted and managed by you on a computer on your premises. 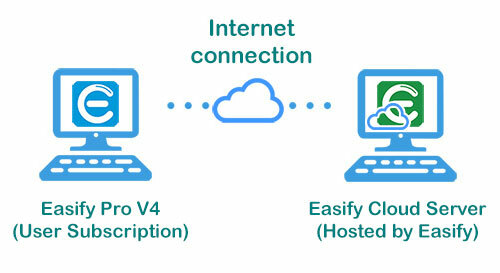 And finally, in this configuration we have an Easify Cloud Server which is hosted by us for you in the Azure cloud, with an Easify Pro V4 client with a User Subscription connecting from somewhere on the internet (i.e. from work or from home). These examples show you the different ways in which you can configure a simple Easify installation where you have one Easify Server and one Easify Pro client. We will next discuss the different types of Easify licensing before talking about some more advanced installations. As mentioned previously there are only two types of Easify licenses, Computer Licenses and Subscription Licenses. 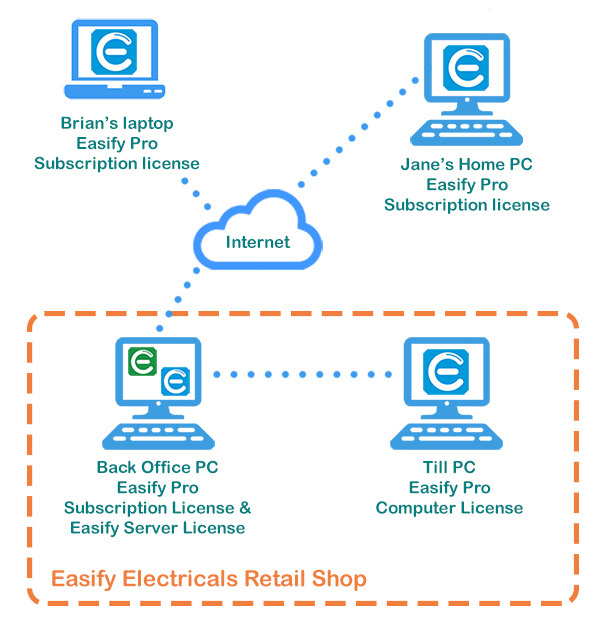 Easify Computer Licenses can be purchased from our online shop, and allow you to use the product that they relate to on a single computer. There are two ways to license an Easify Server, either with a Computer License, or with a subscription. Each Easify Server you install on-premises requires its own unique computer license. You can install multiple Easify Servers on a single computer (if you want to use Easify to run multiple companies or branches), each server will require its own computer license for the computer. For example if you have 2 Easify Servers running on one computer, you will require 2 x Easify Server licenses. A computer license is purchased as a one-off fee, with no ongoing fees. Easify Cloud Servers are only available via a subscription. You simply pay a nominal monthly fee, and we take care of the rest. 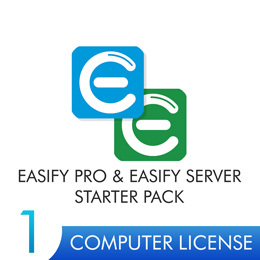 Unlike Easify Server, Easify Pro can be licensed in two ways. Either by a computer license, or by a subscription license. 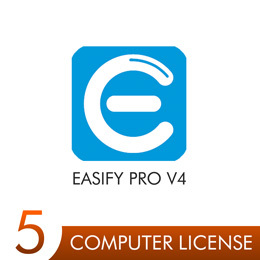 When you purchase an Easify Pro computer license, it allows you to use Easify Pro on the computer that you have installed the license on. Easify Pro computer licenses are paid for with a one off, fee with no ongoing fees. 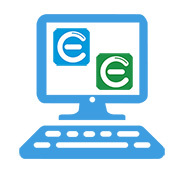 A computer license allows unlimited users to use Easify Pro on the computer that the license is installed on, as long as only one user is using the computer at a time. This type of licensing is best suited to fixed shared computers such as tills, where many different users will be using the computer. NOTE: Easify Pro computer licenses do not allow you to use Easify Pro over the internet. For this you will require a subscription license. Easify Subscription Licenses can be purchased from our online shop. Subscription licenses allow you to use the software they relate to based on paying a regular monthly fee. If you remember the basics section we talked about an Easify Pro client connecting to its Easify Server over the internet, this type of connection requires a subscription license. 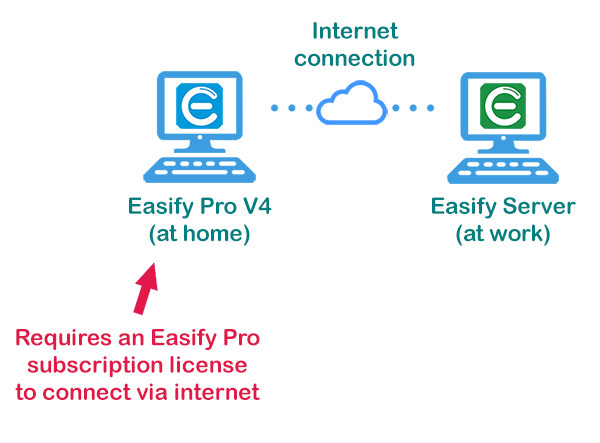 In order to connect to your Easify Server over the internet requires an Easify Pro subscription license. So if you want to be able to access your Easify Server over the internet, you will need an Easify Pro subscription license. This also applies to Easify Cloud Servers which require a user subscription in order to access them. Easify Pro subscription licenses allow the user that is associated with the subscription to use Easify Pro on any number of computers that it is installed on. So for example you could install Easify Pro on 10 computers at your workplace, and if you have a valid Easify Pro subscription you could log into Easify on each computer without needing a separate Easify Pro computer license on each computer. This is useful if you have more computers than staff. If in your organisation you have the scenario where you have (say) 5 computers in your warehouse and you have 3 staff that run the warehouse, you can purchase an Easify subscription for each of them and they will be able to log into Easify on any of the 5 computers with their Easify Pro subscription. Another benefit of subscription licenses is that there is only a 1 month minimum term. This means that if you want to use additional Easify Pro clients for a short period of time, you can simply purchase subscription licenses, use them for a month and then cancel them. When deciding which types of Easify License to purchase, you don't have to stick to one type of license. If you want to have some Easify Pro computer licenses and some Easify Pro subscription licenses, that's no problem. In the example below we have a diagram showing the computers that will be used in our fictitious company Easify Electricals. In our example, Easify Electricals is an independent high street retailer. They have a small shop front with a till which is used by various members of staff, and a back office where Jane the manager runs the day to day operations of the business. Brian is their field service technician and he spends a lot of time in the field carrying out home visits. This computer is situated in the back office of the retail shop. Jane is the only person that uses this computer. This computer runs the till on the shop counter. Various people hop onto this till during the course of a business day. This is Jane the manager's home computer. She uses this PC from home to carry out business management and reporting outside business hours. This laptop belongs to Brian. This is the laptop Brian takes onto site with him when he is carrying out home site visits. Because Brian and Jane want to use Easify remotely from home, or in Brian's case out on the road, it makes sense for them to have an Easify Pro user license subscription each. Although Jane uses a fixed PC at work, she is the only person that uses this computer so with an Easify Pro subscription she can log onto the back office PC at work, or using the same subscription she can log onto her home PC when she wants to work from home. The Till PC is another fixed PC, but this computer is used by many people, so it makes sense to purchase an Easify Pro computer license for this machine. The Easify Server will be installed and licensed on the Back Office PC. Since Easify Server can only be licensed using a computer license we have no other option for this. Jane will use Easify Pro on this computer by logging in with her Easify Pro subscription. The Easify Server is also installed and licensed on this PC. 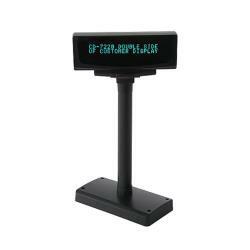 We will purchase and install an Easify Pro computer license on this PC as it is used by many different people throughout the day. Jane can install Easify Pro on her home PC, and log into it using her Easify Pro subscription. As Brian needs to be able to remotely log into Easify while he is out on the road he will need an Easify Pro subscription license to allow him to do this. Although Easify Pricing is beyond the scope of this article, it is worth noting that the requirement for this example is 2 x Easify Pro subscriptions, 1 x Easify Pro computer license and 1 x Easify Server license. The most cost effective way of achieving this is to purchase an Easify Pro Starter Pack which gives us 1 x Easify Pro computer license and 1 x Easify Server license at a discount, and then purchasing the two Easify Pro subscriptions individually. Click here for more information about Easify Pricing.